In some areas around the North Pole, thickness of the sea ice has declined to virtually zero, i.e. open water. What could have caused this open water? Let's go through some of the background. North Hemisphere snow cover has been low for some time. Snow cover in May 2013 was the lowest on record for Eurasia. There now is very little snow left, as shown on the image right, adapted from the National Ice Center. Low snow cover is causing more sunlight to be absorbed, rather than reflected back into space. 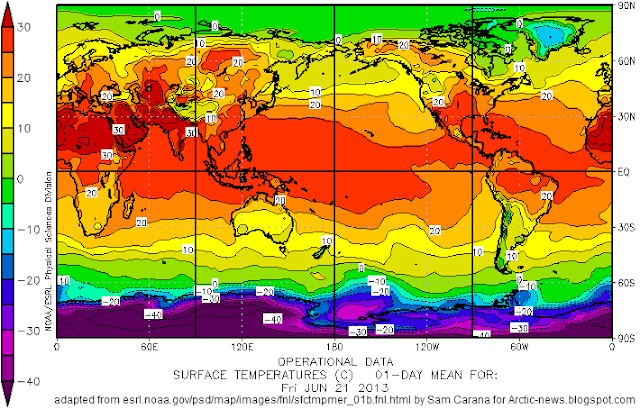 As can be expected, there now are high surface temperatures in many areas, as illustrated by the NOAA image below. Anomalies can be very high in specific cases. Zyryanka, Siberia, recently recorded a high of 37.4 C, against normal high temperatures of 20 C to 21 C for this time of year. 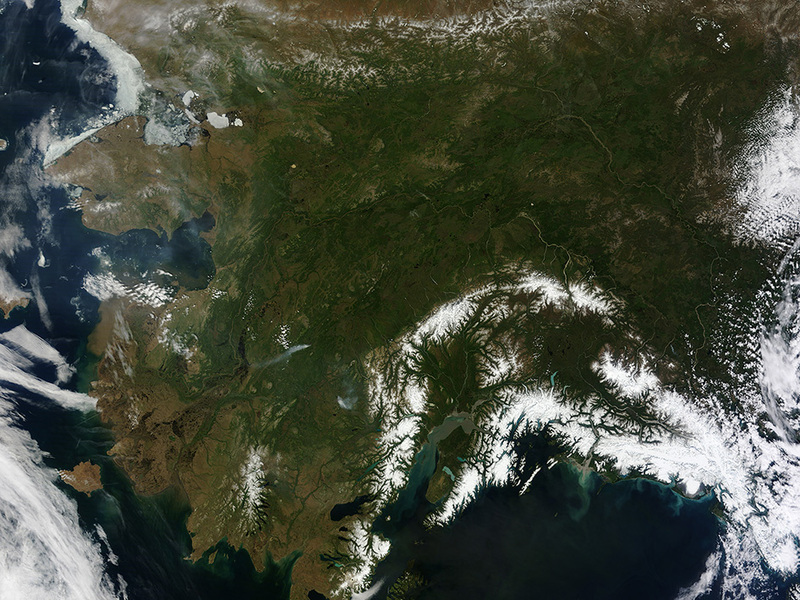 Heat wave conditions were also recorded in Alaska recently (satellite image of Alaska below). NASA image June 17, 2013, credit: NASA/Jeff Schmaltz, LANCE MODIS Rapid Response Team, NASA GSFC - from caption by Adam Voiland: "Talkeetna, a town about 100 miles north of Anchorage, saw temperatures reach 96°F (36°C) on June 17. Other towns in southern Alaska set all-time record highs, including Cordova, Valez, and Seward. The high temperatures also helped fuel wildfires and hastened the breakup of sea ice in the Chukchi Sea." Accordingly, a large amount of relatively warm water from rivers has flowed into the Arctic Ocean, in addition to warm water from the Atlantic and Pacific Oceans. Sea surface temperatures have been anomalously high in many places around the edges of the sea ice, as also shown on the NOAA image below. Nonetheless, as the above images also make clear, sea surface temperatures closer to the North Pole have until now remained at or below zero degrees Celsius, with sea ice cover appearing to remain in place. The webcam below from the North Pole Environmental Observatory shows that there still is a lot of ice, at least in some parts around the North Pole. So, what could have caused the sea ice to experience such a dramatic thickness decline in some areas close to the North Pole? Firstly, as discussed in earlier posts, there has been strong cyclonic activity over the Arctic Ocean (see also Arctic Sea Ice blog post). This has made the sea ice more prone and vulnerable to the rapid decline that is now taking place in many areas. 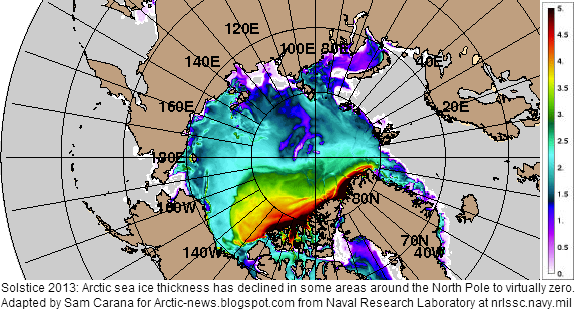 Furthermore, Arctic sea ice thickness is very low, as illustrated by the image below. 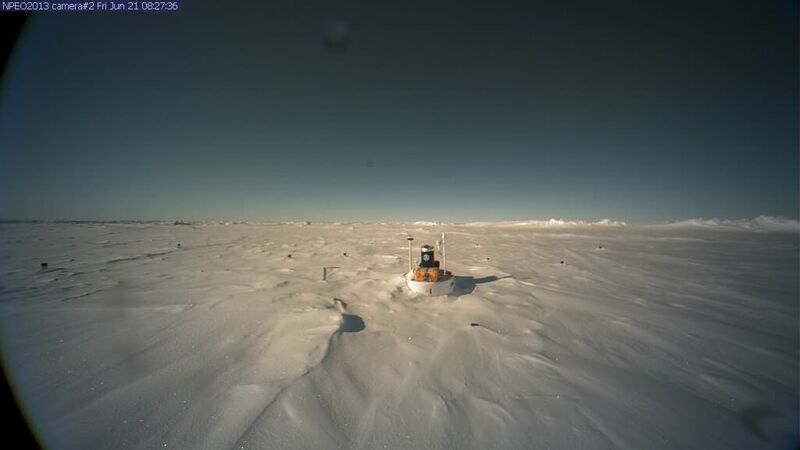 Finally, there has been a lot of sunshine at the North Pole. At this time of year, insolation in the Arctic is at its highest. Solstice (June 20 or June 21, 2013, depending on time zone) is the day when the Arctic receives the most hours of sunlight, as Earth reaches its maximum axial tilt toward the sun of 23° 26'. In fact, insolation during the months June and July is higher in the Arctic than anywhere else on Earth, as shown on the image below. Monthly insolation for selected latitudes - adapted from Pidwirny, M. (2006), in "Earth-Sun Relationships and Insolation", Fundamentals of Physical Geography, 2nd Edition. "The ocean surface freezes if the temperature falls below -2.5C. The reason for the negative melting point is the presence of 4-5% of sea salt. Only in the polar regions does the sea surface cool sufficiently for sea ice to form during winters. 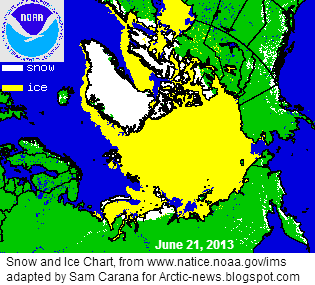 The sea ice cover is currently thinning near the North Pole between 80-90 degrees north. This part of the ocean is very deep. It receives heat of the Gulf Stream from the south: as the warm water vapourises, its salt content to water increases. This densifies the Gulf Stream which then falls onto the sea floor where it dissipates its heat to the overlying water column. The deep basin of the Arctic Ocean is now getting sufficiently warmed for the thin sea ice cover to thin on top of it. The transportation of heat to the icy surface is combined with the winds that push cold surface water down while rising heat to surface." Indeed, vertical mixing of the water column was enhanced due to cyclonic activity, and this occurred especially in the parts of the Arctic Ocean that also are the deepest, as illustrated by the animation below. The compilation of images below shows how the decline of sea ice has taken place in a matter of weeks. This spells bad news for the future. It confirms earlier analyses (see links below) that the sea ice will disappear altogether within years. It shows that the sea ice is capable of breaking up abruptly, not only at the outer edges, but also at the center of the Arctic Ocean. As the Arctic sea ice keeps declining in thickness, it does indeed look set to break up and disappear abruptly across most of the Arctic Ocean within a few years. Models that are based on sea ice merely shrinking slowly from the outer edges inward should reconsider their projections accordingly. Heat transfer from ocean to air and the affects of atmospheric change happening above along with rise of opacity to heat escaping back to space after light gets transformed to heat on striking darker surface spells doom due primarily to methane ice. The physics of the situation and lag time, hysteresis will give rise, is giving face to entropy rise of a closed system not bound by Earth's prior open systems o familiar Nature like the Amazon forest basin and the Coral of Tropics. The politics of the situation and war time food crisis upon us is likewise not fully appreciated. Mankind needs to act like a giant northern hemispheric ice mass for centuries to undo the over use of fossil fuels that sent us into this mess at the cost of Earth. As Albert described how, in past the northern hemispheric ice mass acted as check or stop to the release of Methane going into overdrive and full blown runaway. We need to somehow stop it now and keep hope. Because otherwise Earth goes into moist runaway Forced by Methane release presently accelerating in self release resulting in permanent loss of relative solar radiance for liquid water..
Time to pay the piper or face the reality of planet shift fully into domain of Moist Runaway heat. Changing ocean current and temperature of the planet back will take time and agreement that goal of economy is stop of loss of Earth ecosystem. There is an additional factor at play here. With Coriolis, a high pressure, clockwise rotating weather system induces clockwise water currents and this concentrates water and ice into the centre of the weather system. Indeed, in the classic configuration, the centre of the Beaufort gyre is higher than the surrounding water. By contrast, a cyclonic weather pattern pushes floating ice and fresher water outward. This may be the explanation of why open water is seen now around the North Pole.